Even though driving fatigued, sleepy or tired is undeniably dangerous, drowsy driving occurs on Alabama roadways every day. Sleep-deprived driving contributes to many accidents in, not only the Birmingham area, but throughout the entire State of Alabama. Sleep deprivation is an especially important and relevant topic as it relates to those who drive for a living. According to a study performed by the division of sleep medicine at Harvard Medical School, approximately 250,000 people fall asleep while driving every day. The National Highway Transportation Safety Administration estimates that 100,000 crashes and 40,000 injuries occur annually due to driver fatigue and/or sleep deprivation issues. An additional study conducted by the National Sleep Foundation’s 2005 Sleep in America poll indicates that 60 percent of adult drivers – about 168 million people – say they have driven a vehicle while feeling drowsy in the past year, and more than one-third of those people have actually fallen asleep at the wheel. These are frightening statistics. The National Highway Traffic Safety Administration (NHTSA) estimates that about 100,000 crashes result from driver fatigue every year. Sleep-related crashes are most common in young people (ages 18 to 29), especially men, adults with young children, and individuals who perform shift work. Driving while fatigued can be particularly dangerous for individuals who drive trucks, buses or commercial vehicles as an occupation. Due to the sheer size and weight of these vehicles, the results and damage that can be caused by a collision due to the driver falling asleep are enormous. Unfortunately, a driver who falls asleep will not be able to practice customary crash avoidance techniques and will likely cause problems on the road. When a serious accident occurs, the victims of the crash could be permanently impaired and could be limited in their ability to work for the rest of their lives. Victims could experience serious pain and a significant decrease in their quality of living. If this occurs, then the driver can be required to compensate the family members who lost a loved one or the injured individuals. The experienced automobile accident attorneys of Hollis Wright can help you determine what damages are available and can help you fight for the maximum amount of compensation. Our experienced accident attorneys will help gather all of the evidence you need. We will work to maximize your compensation through an out-of-court settlement or a courtroom verdict. Get plenty of rest and sleep, especially if you know you will soon be driving a long distance. Eat well and stay hydrated while you are on the road. Keep a drink with you or gum to chew if you start to feel tired. Pull over or stop if you are feeling tired or sleepy. If you observe someone else veering off the road and/or they appear like they are nodding off while driving, get far away from their vehicle. 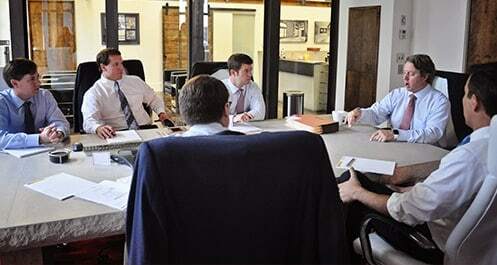 The Birmingham accident and injury attorneys at Hollis, Wright, Clay & Vail, P.C. are here to help and serve you. Please contact us now if you were injured in an accident for a free and confidential consultation so that your rights can be preserved and you can receive compensation for your injuries. You can call toll free at 844-529-8255.